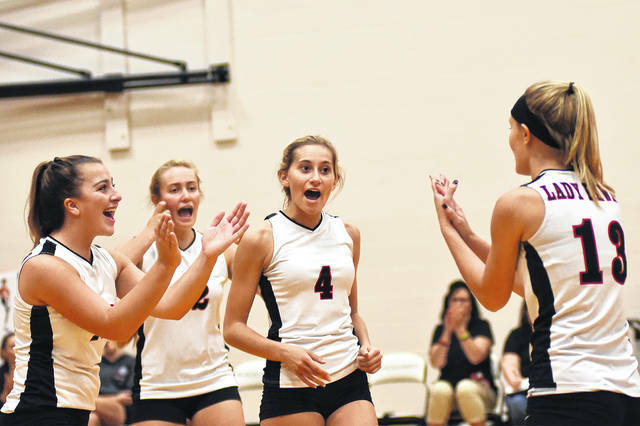 Olivia Murphy (4) and her teammates celebrate after a point during Mississinawa Valley’s home match with Union City (Ind.) on Monday night. The Blackhawks swept the Indians in three sets to win the border battle. Riley Price (13) plays some defense during Mississinawa Valley’s home match with Union City (Ind.) on Monday night. The Blackhawks swept the Indians in three sets to win the border battle. 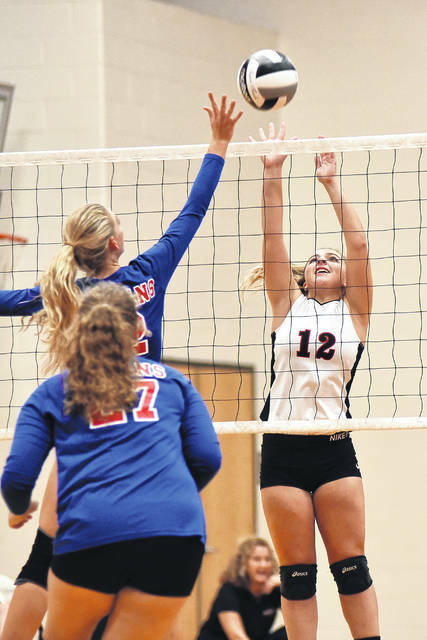 Sidnie Hunt (18) sets a shot for one of her teammates during Mississinawa Valley’s home match with Union City (Ind.) on Monday night. The Blackhawks swept the Indians in three sets to win the border battle. Taylor Stachler plays some defense during Mississinawa Valley’s home match with Union City (Ind.) on Monday night. The Blackhawks swept the Indians in three sets to win the border battle. 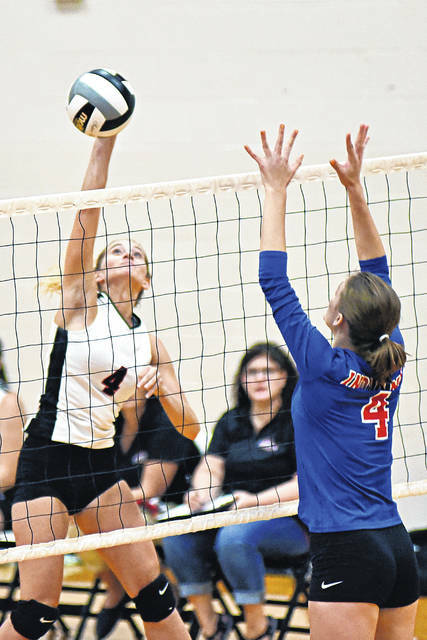 Emily Scholl (12) goes up for a block during Mississinawa Valley’s home match with Union City (Ind.) on Monday night. The Blackhawks swept the Indians in three sets to win the border battle. Kya Lavy (35) sends a serve over the net during Mississinawa Valley’s home match with Union City (Ind.) on Monday night. The Blackhawks swept the Indians in three sets to win the border battle. 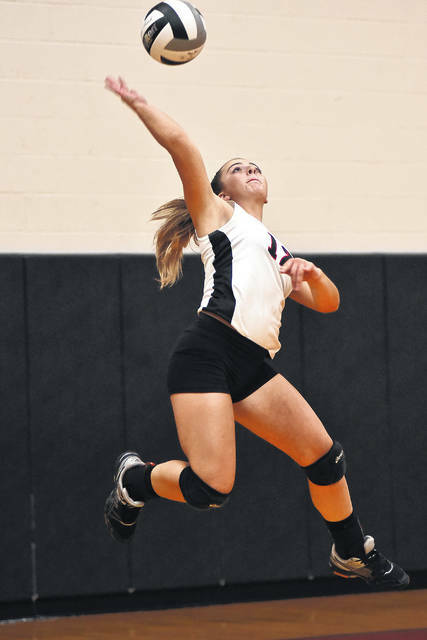 Leah Scholl sends a serve over the net during Mississinawa Valley’s home match with Union City (Ind.) on Monday night. The Blackhawks swept the Indians in three sets to win the border battle. Olivia Murphy (4) hits a shot over the net during Mississinawa Valley’s home match with Union City (Ind.) on Monday night. The Blackhawks swept the Indians in three sets to win the border battle. 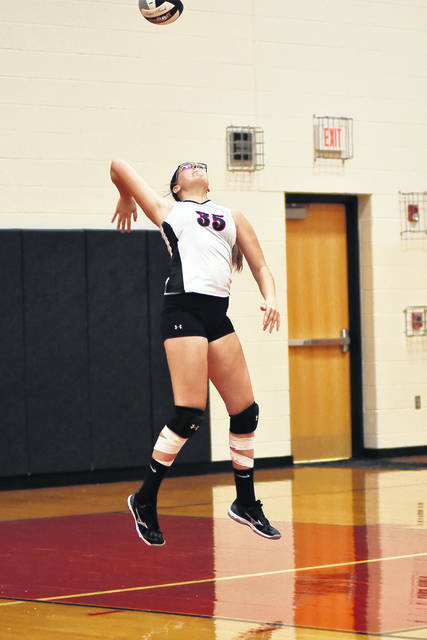 UNION CITY – It was the annual border battle between the Union City Indians and Mississinawa Valley Blackhawks and when the dust settled it was Mississinawa coming out victorious on their home court winning in three straight sets 25-21, 25-10 and 25-23 to take the match. The Indians came out firing winning the first 4 points firing up the sizable crowd from Union City on hand to watch. Trailing 6-2, MV chipped back in behind a strong service game. Sidnie Hunt got the lead on 4 straight service points, including 3 aces to go up 7-6 prompting Union City to take a time out. Icing the server paid off breaking the ’Hawks and the two teams traded points for a few rounds. Sophomore Taylor Stachler showed a strong service game as well as she helped put the Hawks up 13-10 and later finished out the first set totaling 8 points and a 25-21 win. Junior Kya Lavy opened the second set with 4 straight points to help MV jump on top 5-1. The Blackhawks would extend the lead to 10-3 and then 17-7. Sophomore Riley Price then took her turn behind the line with 4 straight points to up the lead to 21-8 and the Hawks would close it out from there winning set two easily, 25-10. Mississinawa Valley took set three 25-23 to close out the match. 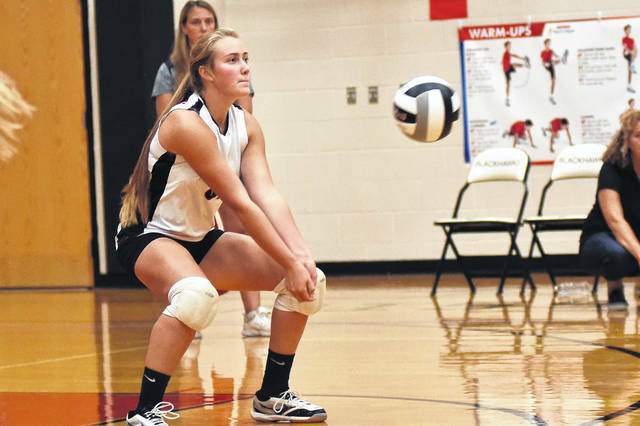 Leading the way for Mississinawa was Sidnie Hunt with 6 aces, 10 kills, 7 assists and 9 digs. Olivia Murphy had 5 kills, 12 assists and 6 digs and Taylor Stachler also added 4 aces in the win. “I’m happy and super excited about this win and giving us a winning record to date,” MV coach Billie Hunt stated. Mississinawa improves to 6-5 overall and is on a roll, winners of their last three games. They currently are 3-1 in the Cross County Conference and know they have a tough week ahead with games at Miami East and Covington. With defending CCC champs Miami East and Covington this week coach Hunt was a little frustrated with their focus and missed serves in the game tonight. “We have a very strong service game, but I was a bit frustrated with the number of missed serves we had. With this being a 3-game week and two top teams in the conference we have to be sharp. We can’t have those mental errors and missed serves and expect to win,” Hunt said. Hunt was quick to point out her girls are playing tremendous and doesn’t want to take that away from them. “We have to be consistent and sharp,” Hunt said. “We can’t go from one game missing 10-12 service points to the next game missing one. We have to improve in that area. “We have a strong team and all-around team with good players who are working hard and if we can sharpen it up we can be even better,” Hunt added. This entry was tagged Billie Hunt, CCC, girls volleyball, Mississinawa Valley Blackhawks, Olivia Murphy, Riley Price, Sidnie Hunt, Union City Indians. Bookmark the permalink.